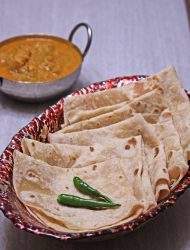 Roomali Roti | Soft and Thin Rumali Roti, is a popular flatbread from the regions of India and Pakistan and it resembles the texture and the fold of the roti resembles the Handkerchief and hence called the Handkerchief roti. Add the flours, salt and oil in a mixing bowl and add water slowly to make a very soft and slightly sticky dough. I used my stand mixer to make the dough. Knead the dough until it is elastic. The dough has to be slightly sticky as that will help in rolling it out thin. Grease the dough with the remaining 1 TBSP of oil and let it rest for at least 30 minutes. If you can let it rest longer, it is even better. When ready to cook, make even sized 10 to 12 balls from the dough. If you have a large wok to work with, then the dough ball cab be slightly larger. If your cooking surface is smaller, make smaller balls so you can make smaller Roomali roti. Dust the dough balls with flour and roll it as thin as possible. If the dough retracts back too much when rolling, let it rest for 5 minutes and then roll again. In the meantime, heat a wok or any wide wok shaped pan inverted on the flame. We will be cooking these Roomali Rotis on the outer side of the pan. When the pan is nice and hot, place one of the thinly rolled roti on the pan and cook until bubbles appear. Flip it once and let it cook on the other side as well. Fold the cooked roti on the pan and then place in between layers of kitchen towel to keep it warm and soft until we make the rest. Serve warm with some rich Subzi.